A recent survey of UK manufacturers carried out on behalf of ABB Robotics has revealed that concerns over cost of ownership and lack of experience in implementing and using robots are preventing many companies from investing in robotic automation. The survey received responses from 221 companies of all sizes, including SMEs. Of these, 134 are not currently using robots, with 65 ruling out introducing a robot in the near future. When asked to specify their reasons, 21 cited cost of purchase and ownership and 38 gave lack of experience as major reasons for shying away from investing in robotic automation. ABB Limited is launching an online return on investment calculator to help UK small to medium-size enterprises (SMEs) discover the cost and productivity benefits offered by industrial robots. Available from the ABB website (new.abb.com/products/robotics/roi-calculator), the calculator demonstrates how companies can often recoup their outlay on robots within just 2 years through enhanced levels of performance and competitiveness. Servitization is the process of seeking additional value in propositions to market through services. The addition of service offerings to the portfolio of traditionally product-oriented companies is of growing importance, with innovative new business models underpinning product-service systems. Knowledge-intensive business services (KIBS) and other kinds of advanced business services are increasingly viewed as a vital in keeping manufacturing companies and industrial sectors competitive. This leads to business models which leverage the development of software, mobile apps and other smart services to create novel value propositions, service-type transactions and payment models. The University of Brescia (UNIBS) will be presenting the paper “Towards usage-oriented business models: an assessment of European capital goods manufacturers” in the next EurOMA conference (http://www.euroma2014italy.org). The objective of this paper is to empirically investigate the way business models of capital goods manufacturers are configured and the persisting obstacles/driver toward the development of new service oriented business models, based on the findings from the survey carried out in the T-REX project. The second general meeting of T-REX project has been held on February 5-6th at BRESCIA University’s facilities in Brescia, Italy. Main objectives of the meeting were to go on with this project management and to present the result of the first task, a survey among European industry concerning to new business models oriented to services. T-REX Survey questionnaire is already available in this website. Please read the full piece of news to download the survey document or take part in the on-line survey at the following link: https://www.surveymonkey.com/s/BKHY5HL. IK4-TEKNIKER has participated in the a Spanish Industrial forum hosted by the AEM (Asociación Española de Mantenimiento) where Aitor Arnaiz has exposed some hints about the technologies that can enable the servitization business processes at the industry. Attached is the presentation done by Aitor Arnaiz. 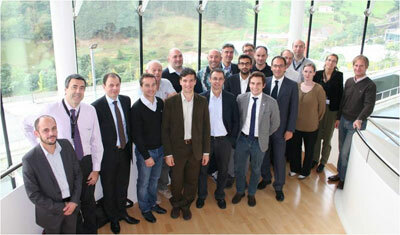 The kick-off meeting of T-REX project was held on October 10-11th in IK4-TEKNIKER’s facilities in Eibar, Spain. Main objectives of this first meeting were to set the official start of the project, establish relations between all partners, provide clarification about administrative issues and define the specific work that each participant is going to make in the following months.